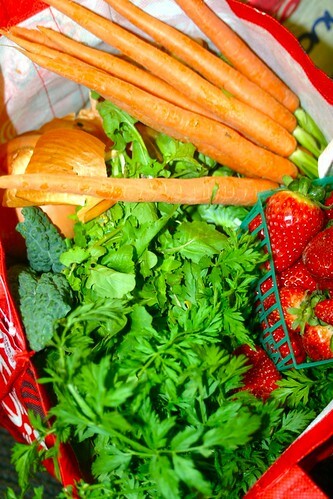 Home » Local, Organic Produce Delivery! Too busy to make it to the Farmer’s Market? Don’t know what to buy when you get there? Don’t have the money to buy organic? We have you covered! 1. Sign up is located on the office fridge. Write down your name and request a full ($25) or half ($13). You must order by close on Sunday night. Wednesday morning before they go to the Santa Monica Farmer’s Market! 3. Please provide a bag with your name clearly marked to the office. If you order regularly, we recommend having two bags in rotation, drop off the empty one when you pick up the full. 4. We split the cases into individual orders on Wednesday morning and then you come and pick it up! We are typically finished with this process around 10am. 5. You can bring cash or check when you pick up or in advance, otherwise your gym account will be charged on Thursday! name on auto delivery and only let us know when you DON’T want the produce. Be sure to check out our Nutrtion Blog for great recipe ideas! Please contact us or ask one of the coaches if you have any questions!